The gameplay in Shiftlings is truly unique. Co-op puzzlers are a rare thing but when they do arrive they have the ability to be something amazing. Shiftlings is no different. Right from the jump you find yourself playing around with mechanics and, assuming you are playing in co-op, you and your friend will learn the intricacies together. This more often than not leads to some hilarious results. Me and Magic were laughing our asses off for most of our time with the game. With 5 worlds to play through, featuring 10 levels each and a new mechanic to play with in each one, there is always something to keep the game fresh. The first couple worlds start off relatively simple to just get you used to the mechanics of this truly unique game, but by world 4 the puzzles become seriously complex. 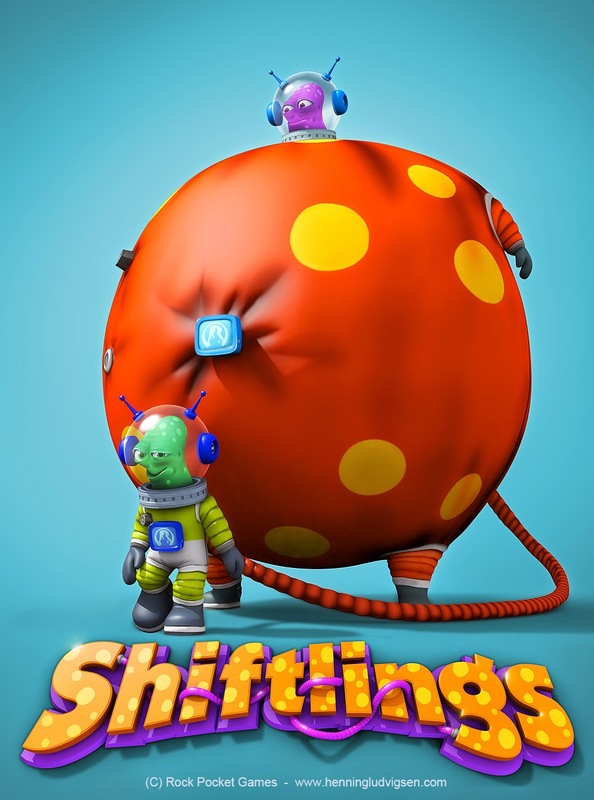 Shiftlings is a tough puzzle game and it’s refreshing in this day and age to have such a game. Playing in co-op though does have it’s downsides. The biggest problem being when you both try to shift at the same time it can lead to a confusing affair. That could be boiled down to communication error but in the later levels when stuff has to be done fast mistakes can easily happen. Hanging the smaller guy off a ledge never gets old however! I can say, without a doubt, that Shiftlings is the best Co-op Puzzle game I have played since Portal 2. The mechanics not only feel unique, but the game itself feels like it was made for a cooperative experience. 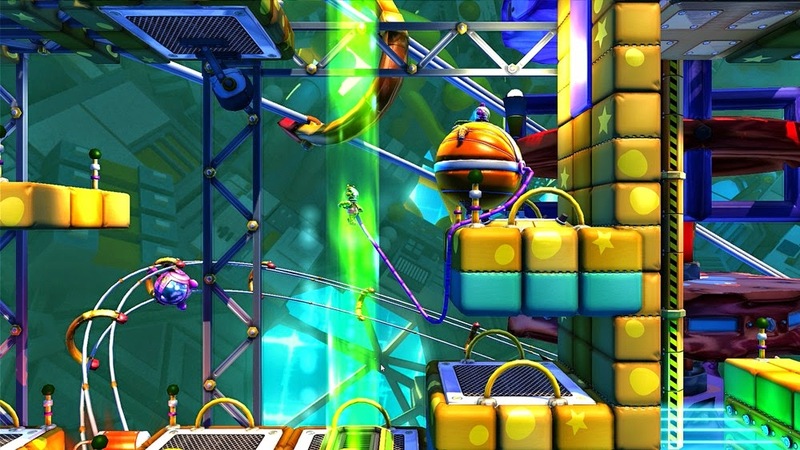 The core of the game revolves around two characters that are connected by a tether, and with the press of a button you can inflate one of the characters. This simple dynamic creates increasingly more complex puzzles as you progress through the game. As Bond mentioned, we found it hilarious when the inflated character (we just referred to him as fat) would drag the smaller one around the levels. 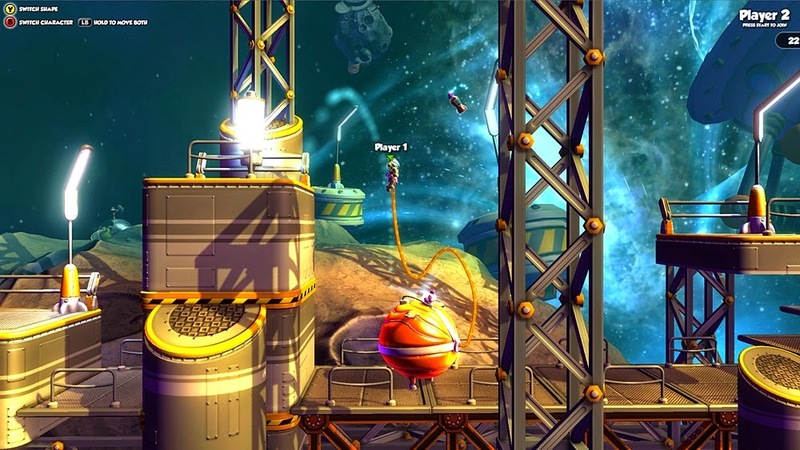 Most Co-op games can easily be completed with a dead-weight partner, but Shiftlings requires constant participate from both players. An aspect that I admire in any cooperative game. The one issue with co-op is the simultaneous shifting. If Bond and I, two good friends who have played tons of games together, can have issues with it, I think most people will too. Especially if you are playing with a random partner. 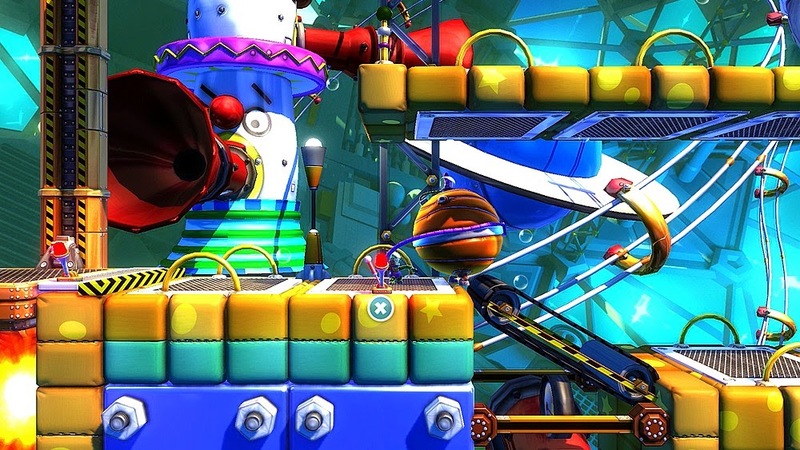 Shiftlings doesn't look like anything special but it does look nice enough and each world has a distinctive theme. However, there is a lot of foreground and background stuff which can make it hard to know where to look. It seems like a lot of it was placed to obscure things or try and confuse the player even more. On the whole though it does a solid job of keeping with the theme of absolute wackiness. The graphics aren't the main selling point of Shiftlings but they aren't a negative either. The different settings of each world keeps the game fresh and the backgrounds make the levels feel more alive. The announcer in the game has some pretty funny lines. Usually making fun of the fat player. But after a while he starts to grate and will just blend into the background noise. The music is also fairly unmemorable. It does keep to the theme of space but it sounds generic and doesn't leave a lasting impression. Quirky noises and the announcer are at the forefront for sound. Both are in line with the overall theme of the game but, as with the sound, it isn't anything that will blow you away. You come for the puzzles and stay for the puzzles people! Shiftlings has a huge amount of replayability. It would be enough if the game only had 50 levels, but there is plenty of reason to go back. From collecting all 3 cola bottles in each level (which some are mind boggling) to the beating it as fast as possible in time attack mode. There is plenty of reason to come back and play more. Shiftlings offers tons of replayability in the form of “Black Hola Cola”, Time Attack mode, and Leaderboards. The Black Hola Cola are collectibles which can be found in each level. Some of which are pretty difficult to find let alone obtain. Time Attack mode unlocks after completing a world and offers players to compete for the fastest leaderboard times. I’m not personally a fan of leaderboards but the collectibles can easily add a few hours of gameplay. But every game has collectibles right? The difference with Shiftlings is that they can be difficult to find and obtain. Which leaves you with a sense of accomplishment when you do collect them. Even though there are only 29, the achievement/trophy list provides plenty of variety. Just beating the games 50 levels will give you a chunk but for the completionists out there you will need to go back and beat all 5 levels in a very quick time, collect all the bottles, and complete all the boss levels without dying. It’s a list that will task even the smartest of gamers and one that should add to the fun of the game. Great list! I see the achievements and trophies in Shiftlings as yet another puzzle for me to solve. I can’t wait to complete the main game and attempt to beat the “par times” for each world. Both reviewers played in online co-op on the Xbox One and completed the first three worlds.